When you are ready for a change of scenery then load up this Legacy SR 340 34A class A motor home, and set out to a new destination. This Forest River model features triple slide outs, and plenty of room for your family of seven. Between the residential refrigerator and the pantry, you can pack in all of your favorite foods for your adventure. You can enjoy your meals at the booth dinette or if you're doing a quick stop you can stay up front and use the cockpit table. All of your traveling items can easily be stored in any of the many overhead cabinets too. The Forest River Legacy SR 340 class A diesel delivers everything you could want in a motorhome. 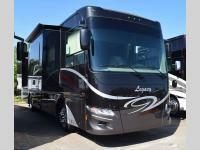 You've worked hard and with any of these motorhomes you will find the luxury that you've earned! These units are built with a Freightliner XCS straight rail chassis, a 6-speed 2500 Allison transmission, and rust resistant aluminized chassis skirts to give you a motorhome that will last a lifetime. You will enjoy the convenience of the driver side tank fill, MCD shades throughout, and the vinyl flooring inserts. You can enjoy the great outdoors underneath the carefree, armless latitude awning with wind sensors, and even watch your favorite movie on the exterior 32" LED TV, plus you can play your best music with the JBL soundbar with integrated sub and bluetooth. 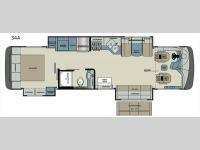 So, come pick out your favorite Forest River Legacy motorhome and get your relaxing vacation started already!